Make your home in beautiful East Tennessee. Enjoy our quiet country living on large riverfront, lakefront, or scenic mountain view home sites. Travel from your private dock thru the river waterways to anywhere your heart desires. Fish in our private lake, or launch your boat from our private boat launch area. Water ski or jet ski up the Hiwassee River on a hot summer day, or sit out on your deck in the cool of the evening and watch the sunset. P.S. If your dream is to own your private island, we can make your dream come true. 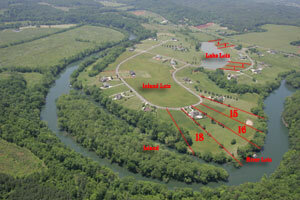 Ask us about our 10 plus acre island located in the scenic Hiwassee adjacent to River Pointe. Designed with Quanta Plus. by Peregrine Concepts. Hosted by DTC Communications. Copyright © 2006 River Pointe Charleston, TN.